The 18-year-old singer has been hard at work all week in the Big Apple rehearsing for the big show and we have some backstage pics to share with you all. 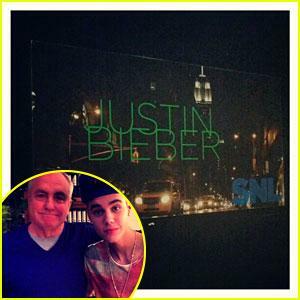 “Watch me on snl tomorrow night thank u Lauren ur the man,” Justin captioned an Instagram pic with SNL creator Lorne Michaels. The official SNL account posted some Instagram pics of Justin‘s dressing room door and his costumes for the evening. OK - he's popular with the tweens, but the hair... really? It's getting a bit dated now.